Need to stabilize a 2-post rack loaded with equipment? Need to mount a deep 1U server on a 2-post rack? Need to secure an overhead ladder rack onto your 2-post relay rack? Need to support a heavy piece of rack-mounted equipment and prevent it from sagging? Need to convert two 2-post racks into a 4-post rack? With their unique feature-set, 2-post racks occasionally present some real-world challenges for the network administrator in the data-center. Rackit's 2-post-rack accessories are tailored to alleviate some of these challenges. Back Support Kit is a depth-adjustable bracket kit designed to add additional support to the back of a 2-post rack. A Ladder Bracket integrates a Rackit Standard Relay Rack with your 'ladder' rack system. 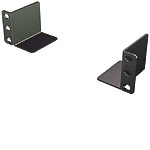 A Rear-Mount Support Kit is a pair of brackets that provide extra support at the back of a 2-post rack for mounting heavy equipment.